Work on beginning reading skills with a fun building block activity. 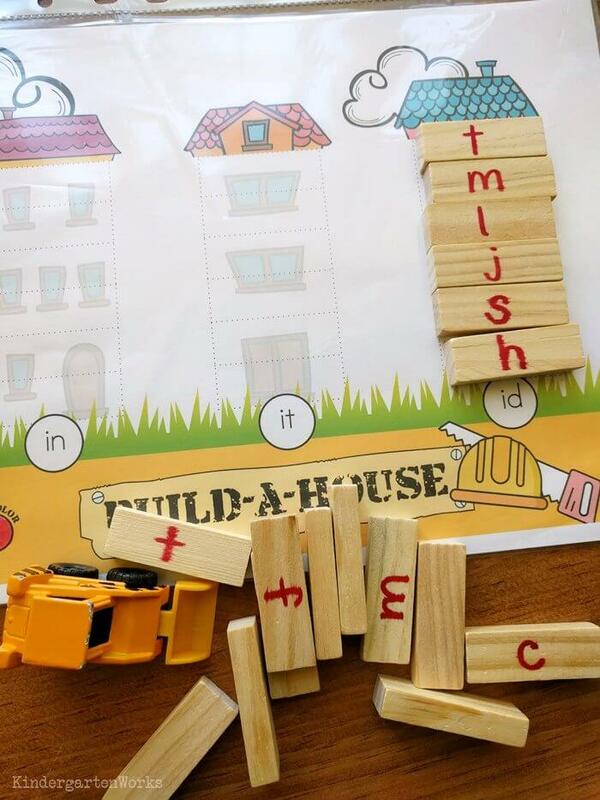 This free onset and rime activity is perfect for kindergartners to build CVC words using word families and mini Jenga-style building blocks. I’ll be sharing affiliate links so you can get the materials to make this hands-on word building activity yourself. 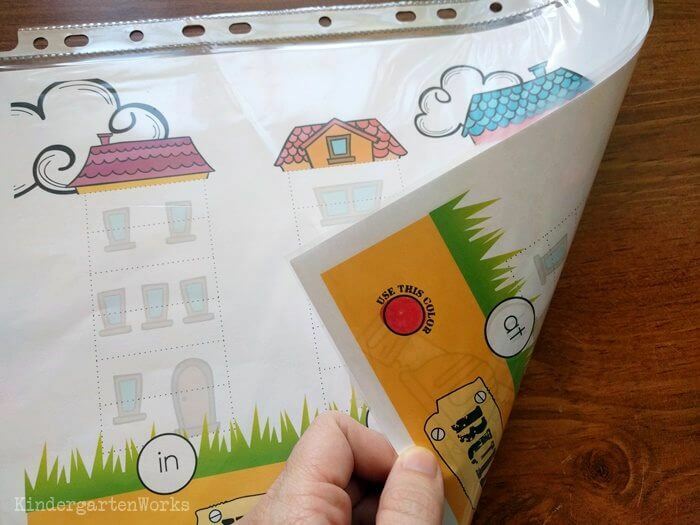 This onset and rime word building activity helps young readers build up their reading skills. Students blend the onset of a CVC word with the rime. It’s age appropriate and an in-between step before students build CVC words in 3 parts independently. But it’s fun because it involves building and using block manipluatives. Plus, you can add in a construction matchbox truck and you’ve got ’em hooked. 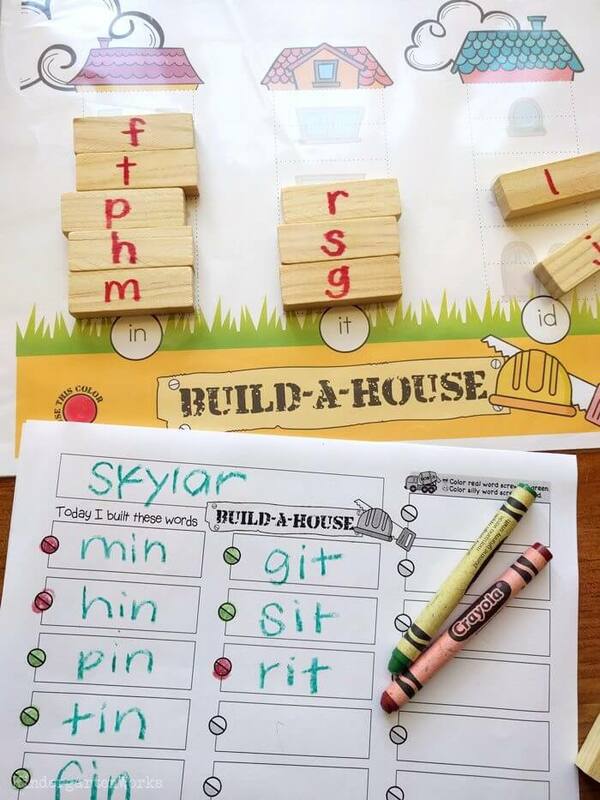 This “build-a-house” (word building) onset and rime activity would work great as a small group guided reading mini-lesson, a center activity or morning work. When I found these mini-jenga blocks at the Dollar Tree I know I had to stash them away until I came up with an activity for them! This onset and rime activity is just right. Kindergarten students take a jenga-style block that has a letter written on it. They place it onto one of three houses. They blend the beginning sound (the onset) of the block they selected with the rest of the word (the rime). This should definitely be done out loud since young readers need to hear themselves blending words. That’s key. They will end up creating word families or rhyming words all in one house. Sometimes students need more practice building words with just e’s, a’s or u’s as those vowel sounds can be more difficult to differentiate from one another. This onset and rime activity can help. I’ve included all of these vowel combinations for students to work with. There are three houses per sheet and they all have the same vowel. The workmats include: at, am, an, ap, ad, ag, um, ut, ug, ub, un, ig, ip, it, in, id, ob, op, ot, od, og, ed, et, en. Let’s go over each piece so you can pull this activity together seamlessly. I’ve got the download below for you. First you’ll want to get your hands on these mini blocks and a permanent marker. 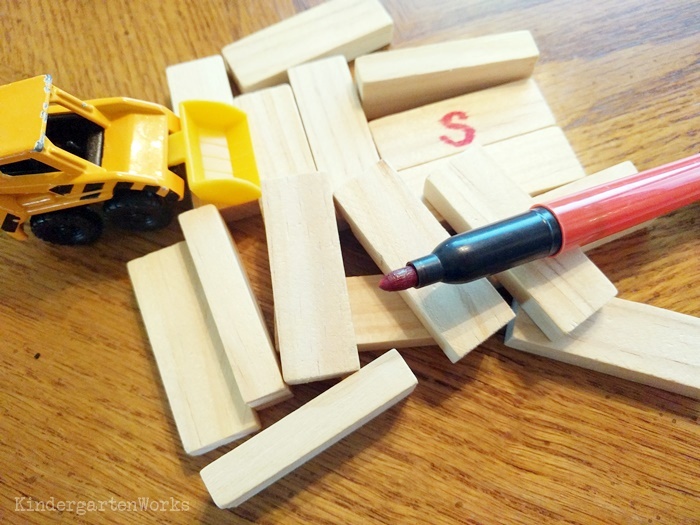 Write letters of the alphabet on your mini building blocks using a sharpie marker. 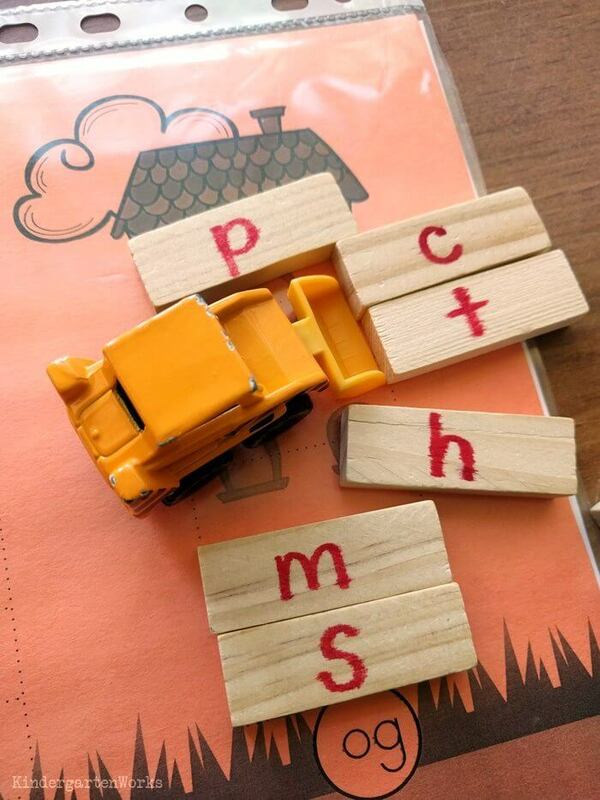 You can use the other side of the blocks for sight words (for a future activity I’ve cooked up) written in a different color, or simply write another letter on the back for more word-building flexibility. This isn’t scrabble – we’re not trying to limit the letter choices here. In fact, having more consonants will be key in making this activity successful. 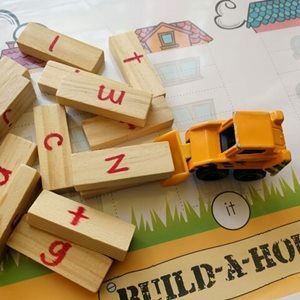 If you have vowels on your blocks, you may want to write them in a different color (not to be used for this activity) or put a dot/marking somewhere in the corner and mention that marking isn’t great for this particular activity. The build-a-house workmats are made in full color, but will print out just fine in black and white. If you need some color but don’t want to sacrifice color ink – simply print them out onto colored construction paper instead! Before laminating, if needed, color in the “Use this color” circle to indicate which color marker side of wooden block they should use. This is in case you have sight words on one side of the blocks written in one color and single letters written in another color to maximize the number of activities you can do with one set of blocks. Laminate your workmats or slide them into plastic page protectors. You can easily put one in the front and one in the back. Print the recording sheets if you want your students to record the words they blend. One is simply for students to record the words they made. They can make up to 18 CVC words per workmat. The other is for students to evaluate whether the word they made is real or nonsense and silly. If you are leaving this activity for a sub, with a parent volunteer or aren’t sure if you’ll remember the directions next year – then you’ll want to print out a set of picture directions. There are 5 ways to play. Pick the directions that match your goals. 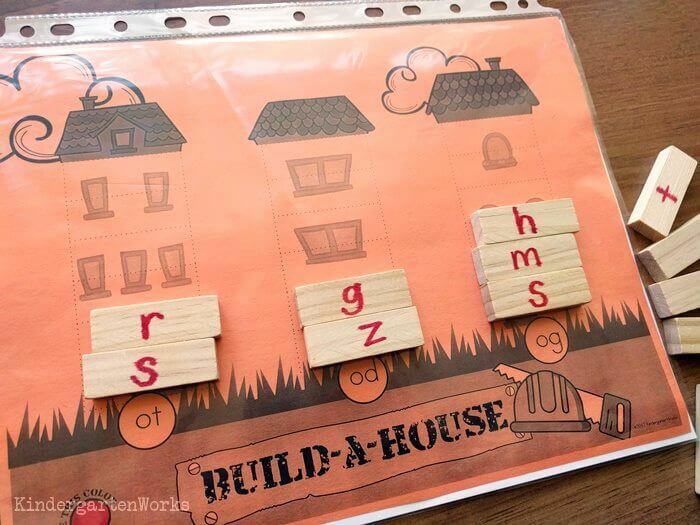 Students build, blend aloud and read each word again when a house is completed. 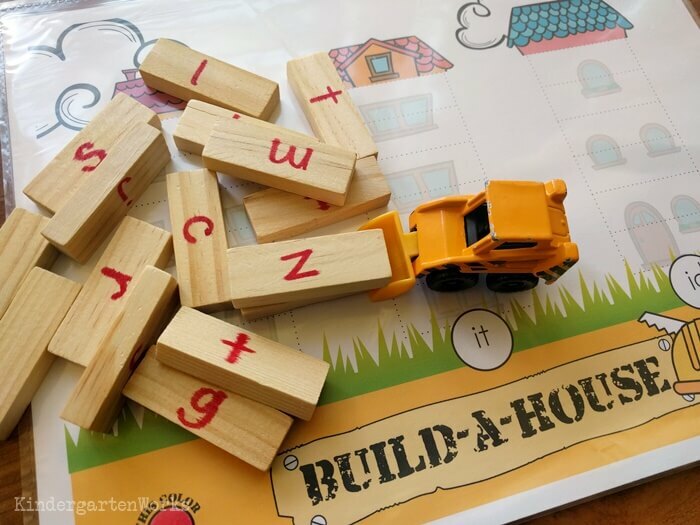 Students build, blend aloud and read each word again when a house is completed and then knock the house down with a construction vehicle. Students build, blend aloud and record each word on their recording sheet. Students build, blend aloud and record each word on their recording sheet. They use color to indicate if it’s real or silly. Students build, blend aloud and record each word on their recording sheet. They use color to indicate if it’s real or silly and count up their real words as points at the end of the time allowed or upon completing 18 words. Now, if you choose the last style of game play with students who are teetering on higher level skills – this will get really fun. They can start to use their reading skills to practice blending silently before they add the block to their workmat. They will begin to catch on that they should choose letters in order to make real words (to earn points) and a little more strategy comes into play. Grab a construction vehicle or two from your classroom stash or pick one up the next time you go to the Salvation Army. It only enhances the fun. There you have a fun onset and rime activity that can help young readers build up their reading skills. By actively blending the onset and rime of a word aloud with manipulative pieces, they get lots of good practice. Like the idea of using inexpensive things to teach reading skills? Me too. Check out these 6 Fun Ways to Teach Reading With Dollar Tree Race Cars. A blending onset and rime activity - complete with workmats and recording sheet. You've got it! Check your email for your Build-A-House Onset and Rime Activity and be on the lookout for my weekly emails. Keep reading this blog for more fresh teaching right now.